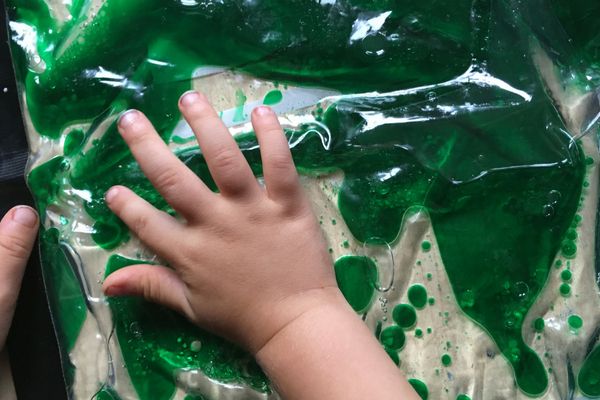 I love giving my kids new and different sensory experiences. 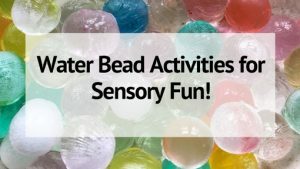 We do lots of crafts and activities with sensory aspects. And they love exploring in sensory bins. But what’s better is to incorporate learning into their sensory explorations. Including the senses in their learning really helps to solidify information in their brains. 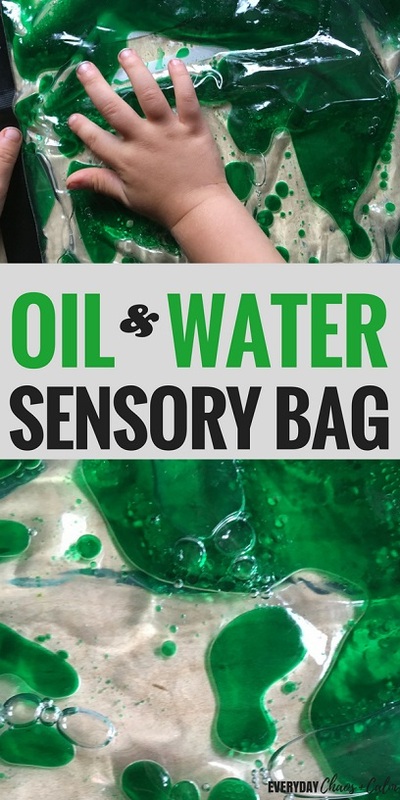 Like with my shape and color sensory bins, this oil and water sensory bag helps to solidify educational concepts while they play and explore. Since this sensory bag is full of liquid, you really want to reduce the risk of bursting. Freezer bags can had weak corners and dripping can happen with the smallest of holes. So the first thing you want to do is tape up the 3 closed sides of your bag with tape. Place the tape on half of the bag and fold it over to the other side. I suggest doing the sides first and then the bottom. Once your tape is in place, it’s time to put the bag together. Start with your baby oil. I don’t measure, but I probably used about 1/4 of a cup of oil. Then drip in some of your food coloring. Then add some water. About 1/4 of a cup of water too. Seal the bag, pushing out most of the air. I do leave a small pocket of air in this sensory bag- but not enough that it could potentially pop. Tape up the open edge of the bag and it’s ready to play! For babies: Tape the bag to a low spot on the wall. This is a great activity for babies who are just learning to sit. It gives them something to look at while they sit, strengthening those core muscles. 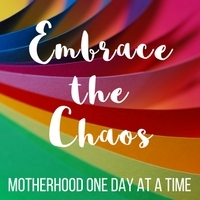 Place a Boppy pillow behind them to support and catch them if they fall. 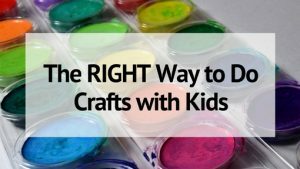 For toddlers: Just let them play! Place the bag on the table and let them squish and shake and explore. 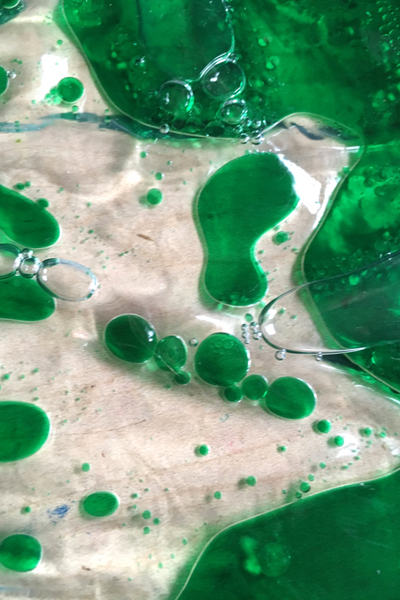 Talk about what they see- how the bubbles form and burst. Let them break large bubbles into smaller ones with their fingers. For Preschoolers and Up: Let them play and explore like toddlers, but add more discussion. Can they shake the bag and get the oil and water to mix? Why not? What happens if you leave it alone. Why does the oil rise to the top of the water? Bring in terms like density and polarity. 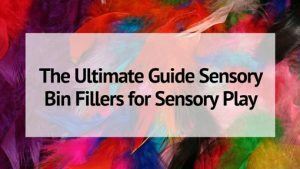 If you liked this sensory bag, check out these 9 Stimulating Sensory Bags to make as well!